Mask-making is an ancient art form that has been practiced world wide, and ranges from simple folk art to the level of high art. I love this very simple process of creating one-of-a-kind art pieces that can be either included into larger mixed media or collage pieces or stand alone! This is a perfect project to begin when you have that creative impulse, but are constrained by time, space, or even ideas. 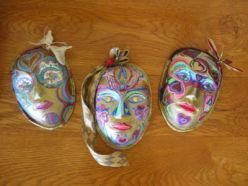 Once you get started, however, if you’re like me, you’ll become so involved in the process, you may end up spending many wonderful hours on just one mask. So, don’t be deceived by its seeming simplicity—this project can take you deeply into the zone of art-making! You may find the mask itself leads you in directions you had not considered, and your inspiration starts to move full speed ahead, surprising you as you move forward. I like to start by using a colored pencil (Prismacolor pencils are wonderful colored pencils favored by advanced and beginning artists) to draw simple designs lightly on my mask—sometimes I pick the color palette for the paint I will later use as I draw—getting a feeling for the mood and look of the mask I’m creating. In the masks above I used gold metallic and bright acrylic colors. Next, I start painting in my designs—do not be afraid to improvise and move away from the designs you have penciled in! The design will evolve as you go along, so trust your self and be spontaneous and in the moment. Remember, making art is not about the complexity of the project or about playing by the rules. It’s about getting into the zone and letting go and staying focused at the same time. If I want to change my design, I cover up the area with Titanium White paint or gesso. So I don’t get too hung up on perfection—it’s easy to make corrections. I like that you put a quote from Picasso himself. The masks are beautiful and colorful that I don’t have anything to suggest to make it prettier. You have a taste for art! Thanks for checking out my blog and I hope you will be able to join my little giveaway which will be ending soon. Thank you!